Confession: I have never baked brownies that I was truly satisfied with. I have tried sooo many recipes but I haven't found the one. They taste good but I have never been satisfied with the texture. Like this flourless option from David Lebovitz - I have made this far too many times but I never get the texture he promises on the recipe. Friends have nibbled on those brownies until they vanished but I hate that the brownies crumble in their fingers. I have given up on brownies so much so that I have resigned to baking with the Triple Chocolate Brownie Mixes from Ghirardelli. The texture of that one is always spot on, the only thing I do not like is the over-the-top sweetness. Last weekend though, I was itching to bake something easy and something in my head said, "Brownies!" I wanted something very chocolatey and brownies fit the bill. I saw this recipe from Entertaining with Beth online and it seemed pretty easy so I tried it. These brownies are very fudgy, very similar to dense chocolate fudge. If that is the texture that you like though, this recipe is a winner. 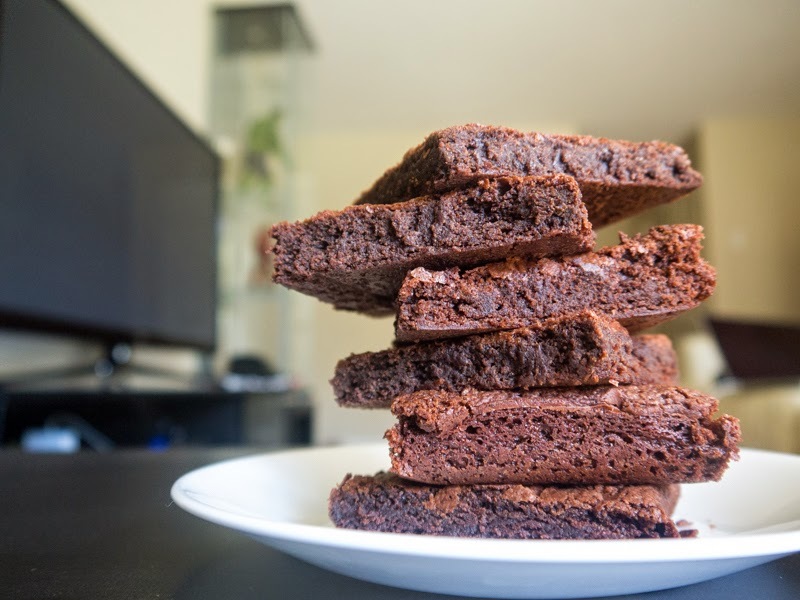 I found that the best way to eat these brownies is to take them out of the fridge, wait a couple of minutes, and then munch on them with cold milk on the side, while reading a book. Milk and brownies. Sounds about right. I wish I could say that this is the one but it is not. :( For me that is. 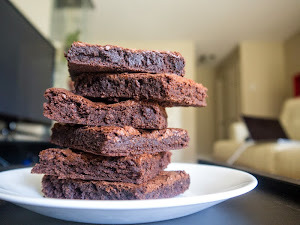 I want my brownies to be a little more chewy, to have a little more bite to it, with a slightly crunchy outside. These are much softer but the chocolate flavor is excellent. 16 ounces of chocolate has to count for something, right? Next time, I'll add a little bit more flour to the recipe and see what happens. Until then, my search for the best brownie continues. Cut into 3 x 3 squares, sprinkle with powdered sugar (icing sugar).